New York City is beloved by theater fans from all over. With shows on Broadway, off-Broadway, off-off-Broadway and various cabaret venues, it’s easy to find entertainment. One setting that often does not come to mind is a restaurant. Theater enthusiasts visiting the city may not be familiar with one establishment, but will love it once acquainted – Ellen’s Stardust Diner. 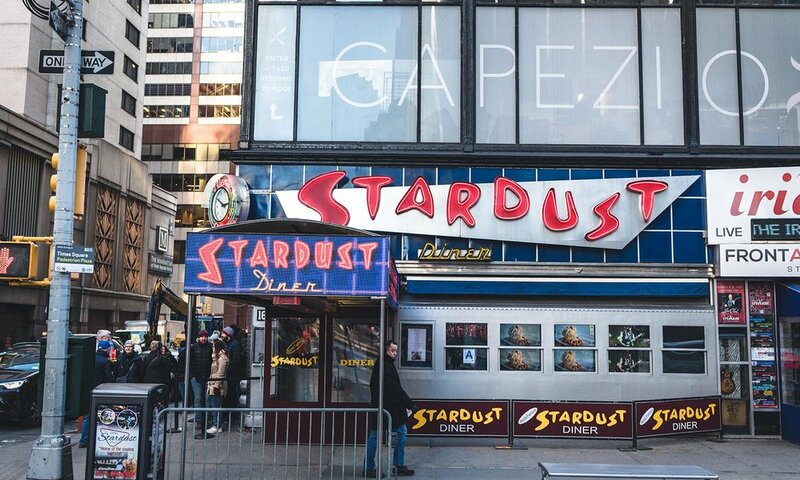 The ‘50s-themed diner at 1650 Broadway is famously home to a singing waitstaff. Founded by Ellen Hart in 1987, customers can enjoy “Mamma Mia Meatloaf” while hearing songs from the show sung by their waiter. While the experience is desired for tourists and theater fans, it may be more so for actors and actresses looking to make it to the theaters down the street. Gabrielle Elisabeth, an ensemblist in Beautiful: The Carole King Musical, worked at the diner before performing on Broadway as Little Eva, a Shirelle and a "One Fine Day" backup singer. The high-rise building in Times Square where Ellen’s settled on the ground floor was also the birth place of several classics created by songwriting teams Goffin/King and Mann/Weil in the 1960s while contracted by Aldon Music. Elisabeth first heard about Ellen’s when she was working for Disney World in 2016 from her friend Nikisha Williams. When she made the move from Florida to New York, she immediately called up Williams and was put in touch with the manager of the diner. After auditioning to be a singing waitress with Alicia Key’s “If I Ain’t Got You,” she made it to the next round in the audition process. As a Starduster, Elisabeth loved performing “If I Ain't Got You,” “Don't Forget Me” from the NBC show SMASH and “Proud Mary” by Tina Turner. She explained that performers often are able to choose the songs, which usually fall into categories: a “build” song, a song that is recognizable, a “pre-bucket” song, a “bucket” song and the occasional ballad. Once an hour, Phillip (as in “fill-up”) the Bucket is passed around the eatery and people make donations. The money raised is split up between the waitstaff on that shift and goes toward training (voice lessons, dance classes, etc.). Elisabeth said Bruno Mars’ “Uptown Funk” is a fan favorite. With the pooled tips, she learned the importance of working as a team and helping one another so everyone does well at the end of the night. “You can build off one another and create a great experience for the guests,” she said. Over the course of time at Ellen’s, she learned how “to audition smarter, not harder.” She would wake up at 7 a.m., audition all day, serve tables from 5 p.m. until after midnight and then do it all over again. She then started budgeting her time better; instead of auditioning for everything she could, she started going in roles she thought she was truly right for. She worked the hours she needed to survive and spent the rest of her time in class. Despite the difficulties, Ellen’s Stardust Diner was still an enjoyable job. One of Elisabeth’s favorite shifts took place when the computers and Posi, the operating system used to take orders and run credit cards, went down. Unable to cash people out and get them along their way, the line outside kept growing longer and longer. “A few of the servers, myself included, went out to the line and started a sing-along. We had a tambourine and a cow bell,” she said.